Any legal ownership a person has in a company or property is classified as an asset, including brokerage accounts, corporate bonds and stocks. For the most part, lawmakers seem to have a stake in big-name, recognizable companies and properties. They need to report only assets worth more than $1,000 at the end of the calendar year, or producing more than $200 of income. (One note about mutual funds: Filers are not required to provide detail on funds’ individual holdings.) Any purchases, sales or exchanges of assets during the year of more than $1,000 must be disclosed as transactions. Reporting the value of a primary residence, unless it produces income, is not required. 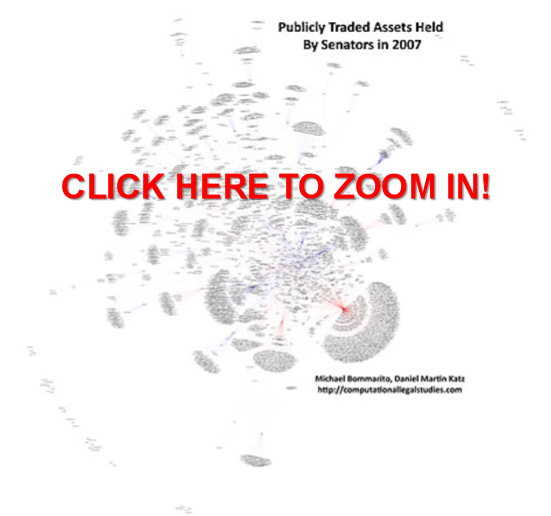 This visual represents a very rough cut of this data for the holdings of Senators in 2007. As is often the case with real form data, there are inconsistencies across the data set. Ideally, one could simply use the asset’s description, which would accurately report the assets held in an account. However, as these are not always provided, the “asset source” is used in their absence. When combined with the mutual fund issues mentioned above, blind trust reporting, and these possible transcription errors, there is a compelling case against strict interpretation of this visual. In any case, enjoy the visual, and again, thanks to Open Secrets for their monumental move forward! Nice work! Looking forward to what’s next. I’m not sure how useful this is. I can tell that Elizabeth Dole owns a lot but not really what she owns. Does she own GM? In that myriad of red lines does one stop at GM or do they all just go through it? And it’s really hard to tell who else owns GM or Apple or other companies or even the mix by party. Previous Previous post: Visualizing 26 U.S.C ___ : At the "Section Depth"